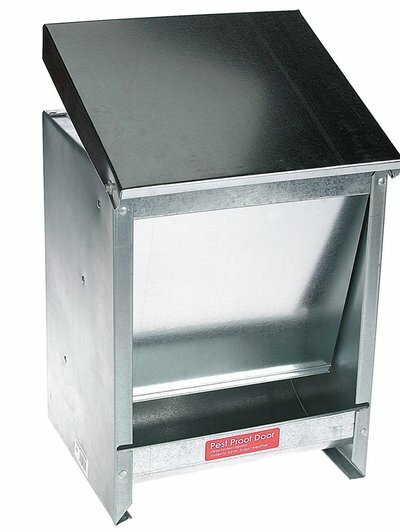 Metal Outdoor Auto Dog Feeder - Great For Large Dogs! ​These containers are durable, and weather resistant and if you read the comments at the bottom of the product (found on Amazon, just click the picture to find out more) you will see that many customers have had theirs for years and are very happy with it! This style of automatic dog feeding is great for larger dogs, and especially pets that love to chew on plastic which is not good for them and hard on your pocket book. If you want to keep your dog food fresh and dry outdoors, then you can simply pour the dry food in this container, for them to feed. This makes it easier if you have an outdoor area or kennels for dogs. Most will secure to the wall or a fence post. Many dogs will learn to regulate themselves and will eat when needed and if you have a watch dog or working dog that you prefer to have live outside, then you need to take care that their bedding and food do not get wet and that they can get at their food when they need it but not all of it at one time! 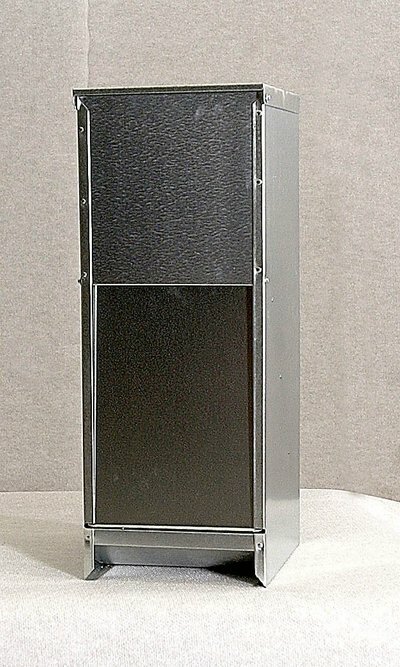 ​Keeps unwanted critters and pests out! These outdoor metal feeders are damp and rain resistant but would work best under a shelter on a wall or post. They are self regulating automatic dog feeders. You simply fill them up and let the dogs feed as needed. Most outdoor dogs will self regulate and not overeat. This saves on losses to pests and rodents when uneaten food is left in bowls to spoil or get wet. Birds especially crows will swoop in for any uneaten food in bowls, so you will save money in the long run by keeping the kibble safe and secure in a metal outdoor feeder. If you want something that holds a lot of kibble, then the one below is free standing, galvanized and durable. It holds 50 pounds of kibble and made in the USA. 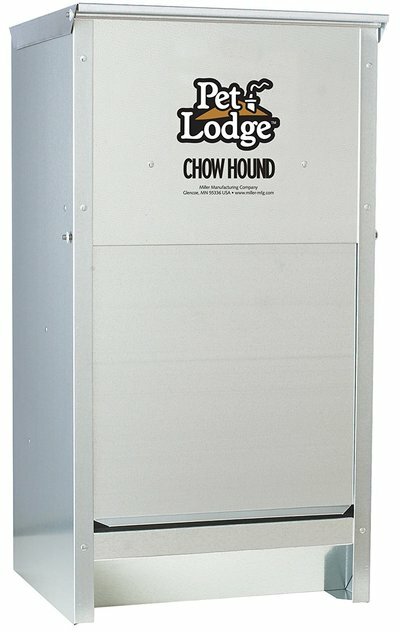 Chow Hound Pet lodge also makes a metal outdoor feeder with a 50 pound capacity. 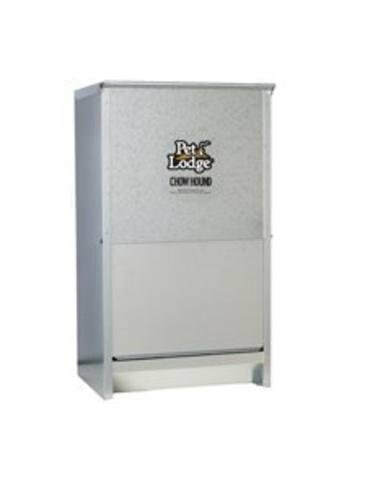 It has a magnetic door that lets dogs in but the pests out. Closes automatically after dog as finished. If your dog wanders around after each mouthful like my dog does, this can be handy as they will have to nudge it each time they want to eat. Save on feeding costs by protecting the outdoor food supply. Stop it from getting wet, away from insects, pests and birds. Simply pour the entire bag into the hopper and you are ready to go.